POLK CITY, Fla. Fantasy of Flight is proud to announce the second event in its three-part "Living History" Symposium Series, "A Passionate Pursuit," featuring the WASP - Women Airforce Service Pilots - a spirited squadron of pilots who left their homes and jobs at the height of World War II to serve their country as the first American women to fly for the U.S. Military. Part two of the Living History Symposium Series will take place Friday, March 27 and Saturday, March 28, in honor of Women's History Month, and will bring to life the experiences of some of America's most courageous aviators through permanent and semi-permanent exhibits, real aircraft, and most importantly, personal stories from real WASP pilots who will be answering questions and interacting with guests. When every available American male pilot was absorbed into combat overseas, dangerous non-combat flight duty still required pilots stateside for ferrying, testing, dragging targets and liaison - tasks hardly suited for the inexperienced or the faint of heart. Once again the "greatest generation" stepped forward to meet the challenge - only this time the boots were filled by women. Fantasy of Flight's WASP exhibition, which includes aircraft as well as four separate bays that feature historical, anecdotal, and inspirational newsreel footage, original photos, and storytelling panels from the 1940s and today, will serve as the backdrop for historic appearances from real WASP pilots, Betty Blake, Helen Wyatt Snapp and Bernice "Bee" Falk Haydu. On Dec. 7, 1941, 21-year-old pilot Betty Blake was scheduled to fly a tourist from one Hawaiian island to another. Lucky for her, the tourist cancelled the reservation and Blake was not in the skies when the Japanese bombed Pearl Harbor. Although she wasn't hurt, several of her Navy friends were killed and the event changed her life forever. She soon enrolled in the WASP program and flew planes from factories to bases on the Atlantic and Pacific coasts where they would be deployed for combat. Blake recalled, "They didn't think girls would be able to fly military planes," but together, the fearless female pilots logged nearly 60 million miles before the program was disbanded in Dec. 1944. Helen Wyatt Snapp was working as a government clerk in Washington, D.C. when she decided to take advantage of Franklin D. Roosevelt's new Civilian Pilot Training Program and quickly earned her private pilot's license. While her husband, Ira Benton Snapp, was serving overseas, Helen heard about the WASP program and wanted to do her part. She was accepted into the program in Jan. 1943 and served at Liberty Field in Camp Stewart, Ga. until WASP was de-activated. By that time, Snapp had completed more than 1,000 hours of flying time and flew numerous target missions, towing targets for live fire on anti-aircraft ranges. Bernice "Bee" Falk Haydu was an engineering test pilot and utility pilot for WASP for only one year before the program was disbanded, but she later served as President of the Order of Fifinella, the WASP alumnae organization, and was instrumental in the fight to obtain WWII Veterans' status for members of the group. The battle for Veterans' benefits took two years, a national media tour and "much midnight oil being burned," but the bill was signed into law by President Jimmy Carter in Nov. 1977. An active pilot, flight instructor and aviation business owner, Haydu also was instrumental in starting a new group, Women Military Pilots, which was later changed to Women Military Aviators to incorporate women other than pilots. Her WASP uniform can be seen on display at the Smithsonian Air & Space Museum in Washington, D.C. and she wrote a book detailing her WASP experience, entitled Letters Home 1944-1945. For all of her contributions to her country and to the field of aviation, Haydu was inducted into the Aviation Hall of Fame in 2000. 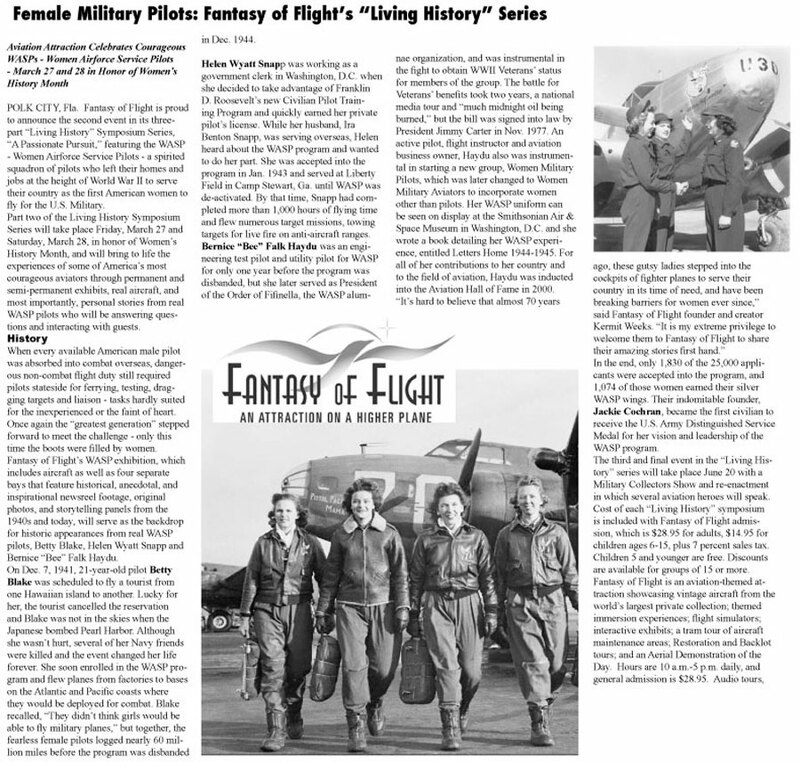 "It's hard to believe that almost 70 years ago, these gutsy ladies stepped into the cockpits of fighter planes to serve their country in its time of need, and have been breaking barriers for women ever since," said Fantasy of Flight founder and creator Kermit Weeks. "It is my extreme privilege to welcome them to Fantasy of Flight to share their amazing stories first hand." In the end, only 1,830 of the 25,000 applicants were accepted into the program, and 1,074 of those women earned their silver WASP wings. Their indomitable founder, Jackie Cochran, became the first civilian to receive the U.S. Army Distinguished Service Medal for her vision and leadership of the WASP program. The third and final event in the "Living History" series will take place June 20 with a Military Collectors Show and re-enactment in which several aviation heroes will speak. Cost of each "Living History" symposium is included with Fantasy of Flight admission, which is $28.95 for adults, $14.95 for children ages 6-15, plus 7 percent sales tax. Children 5 and younger are free. Discounts are available for groups of 15 or more. Fantasy of Flight is an aviation-themed attraction showcasing vintage aircraft from the world's largest private collection; themed immersion experiences; flight simulators; interactive exhibits; a tram tour of aircraft maintenance areas; Restoration and Backlot tours; and an Aerial Demonstration of the Day. Hours are 10 a.m.-5 p.m. daily, and general admission is $28.95. Audio tours, hot air balloon rides, and biplane rides are available at extra charge. The Art Deco-styled Compass Rose Diner serves lunch daily from 11 a.m.-3 p.m. 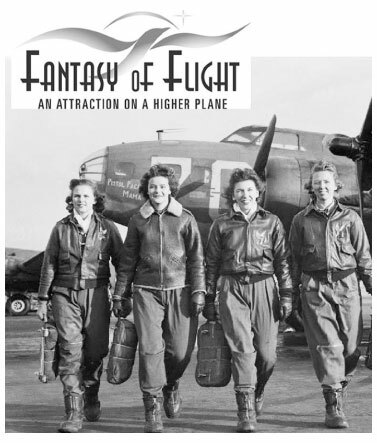 Recent additions to Fantasy of Flight attractions include the Fun with Flight Center for families; The Tuskegee Airmen - They Dared to Fly exhibit; and the multimedia tribute to the WASP (Women Airforce Service Pilots) - A Passionate Pursuit. For more information about Fantasy of Flight, call 1.863.984.3500 or visit www.fantasyofflight.com.